You are here: Home / Weekly Columns / Opinion / Honor View 20 Is the Best Android Phone in 2019 So Far. (ThyBlackMan.com) The goal of smartphone makers is to build a phone that’s entirely a screen. In the last two years, we have come closer to this vision with edge-to-edge screen and curved display panels. In 2019, we see a new smartphone trend called hole-punch. Recently, Huawei’s sub-brand Honor launched Honor View 20, the world’s first smartphone with an in-screen camera. It sports a hole in the screen to accommodate a front-facing camera and this phone so far is the best Android phone we have seen in 2019. The best features of Honor View 20 are its design, display, camera quality, great battery, fast performance, superior sound quality, and smart execution of hole punch. In this post, we have discussed all these features and more in detail. Smartphones have looked the same in the last year and whether you love it or hate it, the notch trend was insanely driven by the hope that we will see a full-screen smartphone. Instead of focusing on building a different tech, a large number of smartphone makers around the world copied each other and introduced display panels with the notch. 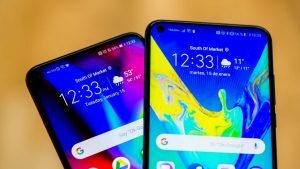 Those who chose a different path ended up changing the look of the notch by either making a waterdrop notch or by simply changing its placement. None of them fixed the real problem. On the other hand, companies like Samsung worked towards the end goal of building an all-screen phone and gave us a glimpse of the future of smartphones. We can see it happening in the Galaxy S10 and also in the foldable phone which is still in development and doesn’t have an official name. Surprisingly, Huawei was one of those innovators who, instead of copy pasting the design idea, made something different. And since we are talking about innovation, one should not forget the Chinese smartphone maker Meizu and their new phone Meizu Zero. Huawei’s sub-brand Honor launched View 20 this year and made everyone believe that this company can do different and better things. The Honor View 20 is equipped with the Kirin 980 chip which is as powerful as the Qualcomm’s and Apple’s latest processors. Huawei’s high-end smartphones also feature the same chipset, but the major difference is Honor packs that much power in a more affordable phone. The camera on the front, which is the major attraction, is a 25-megapixel shooter and the rear camera module sports a 48-megapixel sensor from Sony. Once again, Honor becomes the first to use the tech in a smartphone. If you haven’t heard about the Kirin 980 that powers the Honor View 20, it’s good to know that the processor has a dedicated NPU (neural processing unit) that runs on an AI-controlled software. The latest smartphone has a new feature called AI Clarity for the camera. Another impressive feature on the list is the Honor View 20’s battery life. The phone comes with a 4000mAh battery, so you can expect it to last full day after a single charge. It also supports Super Charge for fast charging so you can get 55% battery level within 30 minutes of charge. The Honor View 20 is fast regardless of which variant you choose. The phone comes in two variants 8GB RAM + 256GB ROM and 6GB RAM + 128GB ROM. The Honor View 20 isn’t perfect since it sports an LED panel which is of course not the best in the market. It also lacks support for wireless charging and doesn’t come in a water-resistant body. But for the price, it is worth buying and in fact, it is the best value for money phone you can buy. The Honor View 20 is a beautiful phone and hopefully, other smartphone makers will learn from it and replace the notch. If you want to buy an all-screen phone, you will have to wait for a year or maybe more, but for those who want to experience something new for less, the Honor View 20 is an excellent phone.